For the 31st year, the National Geographic Society held the National Geographic Bee for students in the fourth through eighth grades in thousands of schools across the United States and in the five U.S. territories, as well as in Department of Defense Dependents Schools around the world. 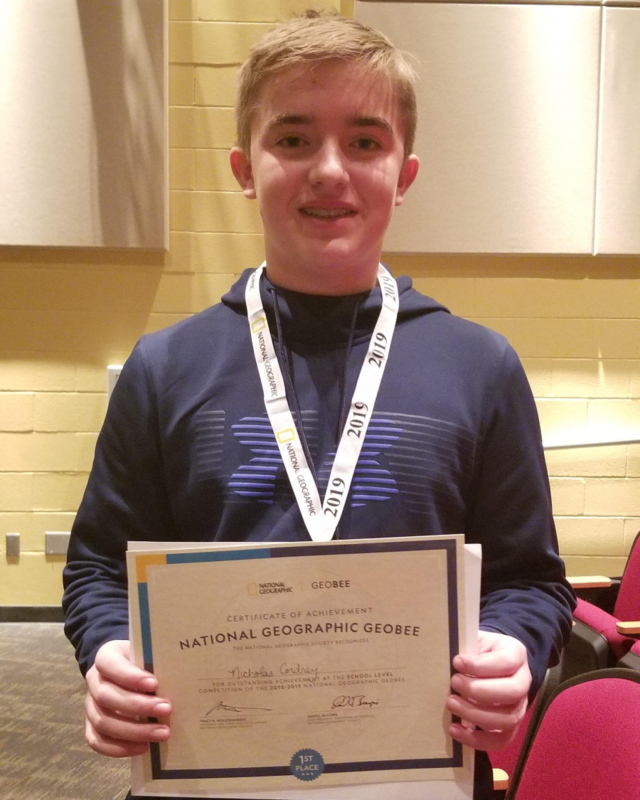 The champion of the Taylor Middle School GeoBee, Nick Cordrey (8th grade) will advance to the next level of competition, a written examination to determine state competitors. Taylor Middle School's 2019 Geography Bee Runnerup was Jossie Enderle (5th grade). Up to 100 of the top test scorers in each state become eligible to compete in their State GeoBee. The winners of the State GeoBees receive an all-expenses-paid trip to National Geographic Society headquarters in Washington, D.C, in May to participate in the GeoBee national championship, competing for cash prizes, scholarships and an all-expenses-paid Lindblad expedition to the Galapagos Islands aboard the National Geographic Endeavour II. Learn more at www.natgeobee.org. The National Geographic Society developed the National Geographic Bee in 1989 in response to concern about the lack of geographic knowledge among young people in the United States. Over more than three decades, 120 million students have participated in the GeoBee.